Please ensure that you provide all of the information requested. There are reasons why we request certain information from you when sending your drawings for quotation purposes. Our quotations include guaranteed achievable temperatures, which are calculated according to the specification of your project, based on the information you supply. This enables us to tailor a system to meet the demands and heat losses of your building. The more information we have, the more accurate the quote will be. 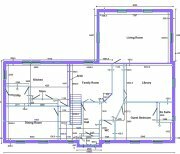 The best drawings for providing a quotation are scale drawings of your floor layouts and elevations. If you don't have scale drawings, then you need to provide as many dimensions as you can possibly include on the drawings. We need the drawings of the elevations of the building because we calculate the heat lost through the fabric of the building, especially through the glazing, so that we know how much heat your underfloor heating needs to replace. We can't do this if we don't know the size of your windows or the type of glazing you're using. We need to know how the floors will be constructed so that we can quote for the correct fixings to hold the pipe down. Slab plus screed is the best one for a ground floor. The type of glazing you use can make a big difference to your heat loss, especially in places like conservatories and rooms with full glass walls. You can either specify the type of insulation, or give us the 'u' value. If you're not sure, your architect will know. The more insulation you include in the building the better for your fuel economy, and the planet of course. You should ideally tell us the 'u' values of the exterior walls and the roof, or at least tell us the quantity of insulation you will be using. Again, your architect will know the 'u' values. Gone are the days when you could just talk about having a boiler. Your choices these days are varied to say the least. You could have a heat pump, a biomass boiler, a traditional boiler, or a combination of any number of heat sources contributing to a thermal store. Importantly, heat pumps and underfloor heating are a match made in heaven. The water from a heat pump is produced at a lower temperature than a boiler, and you need less underfloor heating controls. Hence the reason we need you to be specific - we like to give accurate quotes. Whatever you put on your floor it will have an effect on the output of the heating system. Tiles and stone work best because they have a good thermal mass, meaning they conduct the heat better. If you're having hardwood of some kind, you need to say if it's natural or engineered hardwood. If you use natural hardwood we will include floor sensors to restrict the temperature of the floor and protect the hardwood. If you use an engineered hardwood the floor sensors probably won't be necessary, unless the engineered hardwood manufacturer recommends that you fit them. Carpet is the most insulating floor covering of all, and you should be careful not to use a thick carpet with underfloor heating. We do not recommend laying carpets over hardwood flooring of any kind. You may be living in one place, but building in another. Please let us know where your project is. Sounds like such a simple thing, but you'd be surprised how many people don't provide a phone number. And they're usually the people we need to contact quickly to request more information from them for their quote! We don't believe in hard sell, and will only call you if we need more information. Even if you're requesting your quote by e-mail, we need your address to be able to send the full document to you. It amounts to a booklet full of information that will help you and the other trades involved in your project, to plan your installation. So when you receive your quote, please discuss the information it contains with your project manager, or the other trades on site. Some of the information we include is created in software you might not have, which is the main the reason for posting a hard copy. Please click the button below for a .pdf printable quotation questionnaire. Either complete the information and send it by post with hard copies of the requested drawings, or print it as a check list of the information to put in your e-mail accompanying your drawings in the file formats requested above. Click for a printable form.